Add warmth to your walls with this espresso picture frame and revel in its understated beauty. 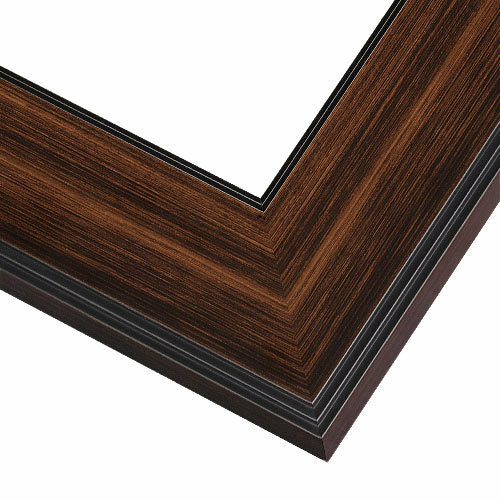 With step details on the inner and outer edges and a warm, espresso finish, the wide, squared profile is a classy photo frame, wedding frame or fine art print frame. Handcrafted by our Artisans from natural, sustainably managed wood. Custom sizes to 1/8th of an inch! A customer favorite from pictureframes.com. Lightning fast shipping. The frame and matting I ordered are fantastic. I was a little nervous going into it. 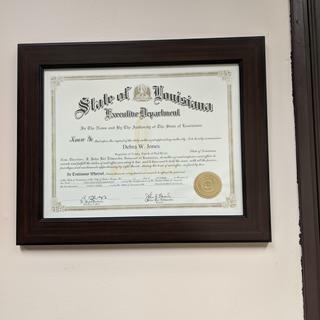 Framing a diploma is expensive so not being able to see true colors and touch things is a risk. The frame came & I unboxed it immediately. Right away unnoticed the matting was wrong. It was white and not the black and yellow I had ordered. I noticed an orange sticker that said "points are for shipping purposes only" - whatever that means. I checked my invoice and email confirmation; both confirmed I had ordered the black and yellow matting. Before I punched up the number to give them the heads up, I removed the back to find that they put my matting in backwards. Maybe that's what the orange sticker is. Anyway, fully satisfied. Frame came on time, looks good, fit mat perfectly, no issues. Wife happywith result. Very nice frame!! Goes great in my office! Very good quality! Similar to frames we had hanging up for our doctors/providers that were discontinued so we are buying all new for everyone and extras! It is a very classy frame. I chose this frame to complement a cross-stitch wedding picture I did. I felt this frame would work well with my Italian watercolor landscape. When you order do you order by the exact size of your picture or do you add the quarter of inch or half an inch that’s under the frame to it ? BEST ANSWER: Always order by the exact size of the print/artwork being framed. Framers will account for the size of the overlap, which can vary from frame to frame. Yes, please order by the size of your picture the frame will come the correct size to hold in your art. Order the exact size of your picture. There will be some natural overlap.